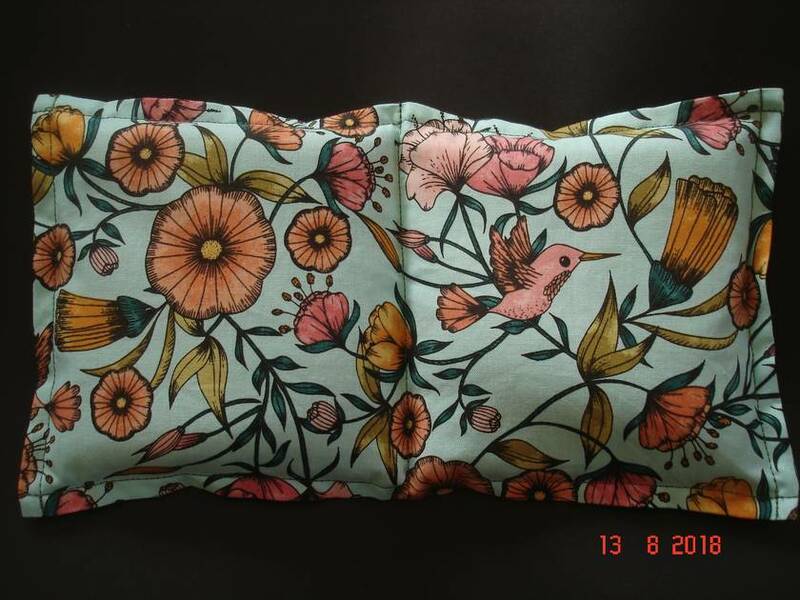 Beautifully made Organic Flax Seed Heat Pack 30 cm X 16 cm. These make a great & safe alternative to a rubber hot water bottle, especially for children. They won’t leak potentially harmful hot water & they never feel completely cold to the touch. Great value for money as they have a multitude of uses both hot & cold. Why Flax seeds instead of other grains? Flaxseed provides gentle, moist heat which promotes healing. Flaxseeds are flowers seeds, rather than grains so they contain 30-40% oil which remains inside the seed to be warmed again & again. Other products can lose their ability to retain heat over time as the water cooks out of them. Heated flaxseed retain their heat longer. Flaxseeds never have that cooked grain smell you sometimes get with other grain based products have when heated over & over again. Flaxseeds can be chilled in the freezer to sooth headaches, migraines, puffy eyes. Warmed in the microwave they are amazing for all kinds of aches & creaky joints, use to ease arthritis pain or RSI, period discomfort, shoulder-neck tension & back pain . Can improve circulation, help sports injuries or just use it to warm up. Cold from the freezer they can help bumps & bruises, relieve joint swelling, head ache or migraine discomfort or sports injuries. Take the chill off your bed if you forget to put the electric blanket on or warm a cot. NEVER leave an unattended/hot wheat bag in a cot with a baby. Divided into two sections to ensure the even distribution of wheat & warmth. Fabric is 100% cotton. Plain Black on the back. Heat 1.30 - 2 minutes in microwave with 1 x cup cold water.